As the weather gets better, summer is a great time for exercise, and an ideal way for families to spend some time together. Swimming is an all round exercise that all the family can enjoy, even babies (though swim nappies are probably a good idea). Over the summer, many swimming pools have special sessions for families, with safe areas for children, and many have floats and water games available. Some pools even have wave machines and bubble generators. For seaside holidays, nothing beats swimming in the sea. Look out for Blue Flag beaches – these have reached particularly high standards, in water quality and environmental issues. Learn what the flags on beaches mean – red flags mean no swimming, red and yellow flags indicate that there is a lifeguard on duty, and black and white flags show that the beach is for surfing only, with no swimming allowed. Be aware of tides and currents too. Cycling is a great form of exercise, and is a green alternative to going places by car. There are lots of quiet road routes and cycle paths, in towns and cities as well as in the countryside. Read through the Highway Code before going out on the roads, wear bright coloured clothing, and remember that traffic can often be moving faster on country lanes than on roads in towns. Cycle helmets limit the risk of head injury – and adults cycling with children should always wear helmets too as a good example. 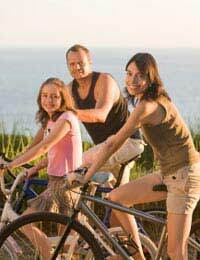 Some councils run cycling training schemes for both adults and children. Walking can be a simple stroll to the local shop to hiking in the hills or mountains. When going for a long walk in a new place or a long way from built-up areas, leave details of the route with someone at home, and carry a map and a mobile phone, and spare food and water. Wear the right clothes and shoes for the type of walk, and carry a lightweight waterproof. There are all kinds of ball games to play outside in the summer, which range from the quiet to the energetic, and can include just two players, or as many players as are available. Some need special equipment or special courts; others just need a ball and plenty of space. There are lots of variations on games of catch – clapping between each catch, going down onto one knee (and then two, and then one hand behind the back…) for a missed catch, or shouting numbers to show who should catch it – and these can be tweaked to take into account the age and skills of the players. Flying a KiteKites can range from simple one made from wire, tissue paper and string, to complicated stunt kites that can perform all kinds of tricks. Choose a windy day and a high point well away from power lines and get flying. Remember…Drink plenty of water when exercising in the heat, keep covered up when the sun is at its height, and wear plenty of sunscreen, even on partly cloudy days. Waterproof sunscreen will stay on better when exercising. But the most important thing – get everyone involved and have fun!